The BioTek ELx808 Microplate Reader offers you precise accurate and repeatable readings, with the flexibility to manipulate and analyze your data to fit your needs. 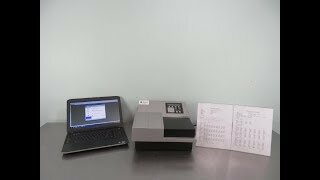 This absorbance microplate reader is self-testing through an on board diagnostic, and can be calibrated with a test plate to make sure your ELx808 is ready to go. This BioTek plate reader comes with a robust catalog of onboard data analysis such as transformation formulas, assay control and validation, and being able to process multiple assays on one plate, and reporting kinetic rate, R2 and onset time without the need for a PC. This microplate reader offers fast kinetics with measurement in as little time as 6 seconds. The BioTek ELx808 Absorbance Microplate Reader is ideal for applications in fields such as agriculture, biotechnology, cell biology, counting and proliferation, Food processing, Kinetic ELISA, Neuroscience and many more. This absorbance plate reader offers 4 Zone temperature control and an incubation range up to 50°C. The BioTek ELx808 has a 96 well plate configurations and a wavelength range between 380 and 900 nm. In addition, evaporation and edge effect are minimized thanks to unique heated track and carrier design. The BioTek ELx808 Microplate Reader also comes with Gen 5 Software that gives users an easy to use, intuitive interface, with data reduction tools to help streamline information, and increase productivity. This plate reader is also gives you superior optics with the clever staggered design to eliminate channel to channel cross talk. The Biotek ELx808 Absorbance Microplate Reader has been tested and is currently ready to ship. This Plate Reader ships out within three days from receipt of order and is backed with our standard warranty. Please note for best operation, this plate reader should be placed on a level surface, in an area where ambient temperatures are between 64-104°F, without excessive humidity, or direct sunlight as it can reduce linear performance. The area should also be clean and free of dust so as not to affect readings from this microplate reader. Should you have any questions, please don't hesitate to contact us.